OWOE - Introduction To Energy - What is a carbon tax, and how will it impact energy use? A carbon tax is a fee imposed on the burning of carbon-based fuels. 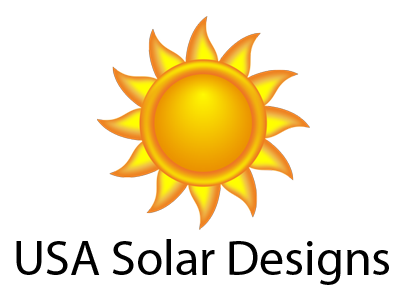 Its purpose is to shift the cost of the societal impacts from emitting carbon dioxide into the atmosphere from the general public to the entities that emit that carbon dioxide (CO2). The carbon tax is one of two major market-based tools available to drive down a country's emissions (the other being cap-and-trade schemes). Many economists, environmental activists and consumers prefer the carbon tax for its simplicity and impartiality. 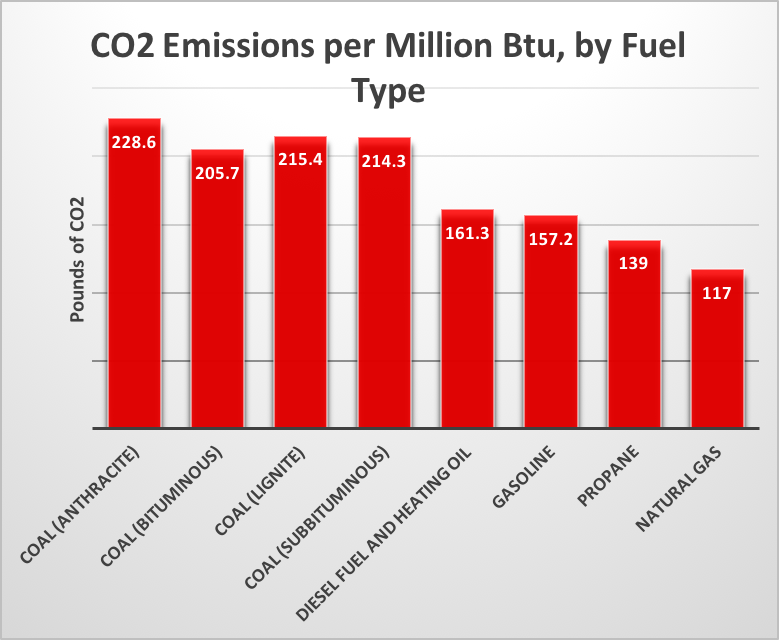 Essentially, the carbon tax is a form of pollution tax, with the pollutant being CO2. The government sets a price per ton on carbon emissions to the atmosphere and levies it as a fee on the production, distribution or use of fossil fuels. For example, a kilowatt-hour of electricity generated from burning coal would have a tax burden approximately twice that of a kilowatt-hour generated from burning natural gas because burning coal emits about twice the carbon dioxide for the same energy (see Figure 1). This creates a pricing mechanism that encourages utilities, businesses and individuals to reduce consumption of what are now higher priced commodities, increase energy efficiency, and/or adopt less carbon intense energy sources such as wind or solar power. The tax would also change the economics of energy sources. Wind, solar and nuclear power would become more economic, and producers would invest more into new generation facilities to the detriment of existing coal plants. And the transition from internal combustion engine vehicles to electric vehicles would accelerate due to the increased cost of gasoline. 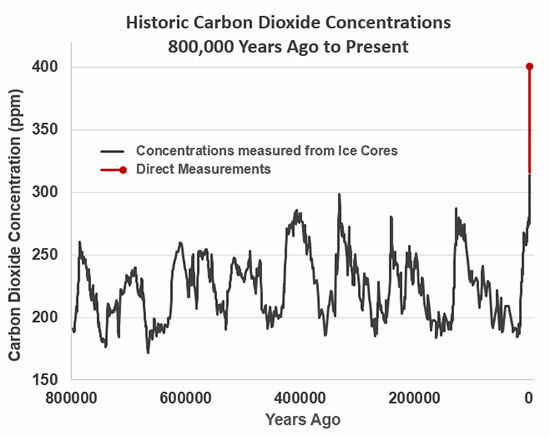 The physical and sociological issue that the carbon tax attempts to address is illustrated in Figure 2 which shows the rise in concentration of CO2 in the earth's atmosphere from 800,000 years ago to the present. The concentration has historically fluctuated between a range of about 175 ppm (parts per million) to 275 ppm until very recently when it has spiked to over 400 ppm. This spike can be closely correlated to the increase in the burning of fossil fuels starting with the beginning of the industrial age. The CO2 rises into the upper atmosphere and traps heat that is radiated back from the Earth's surface rather than letting it dissipate into space. 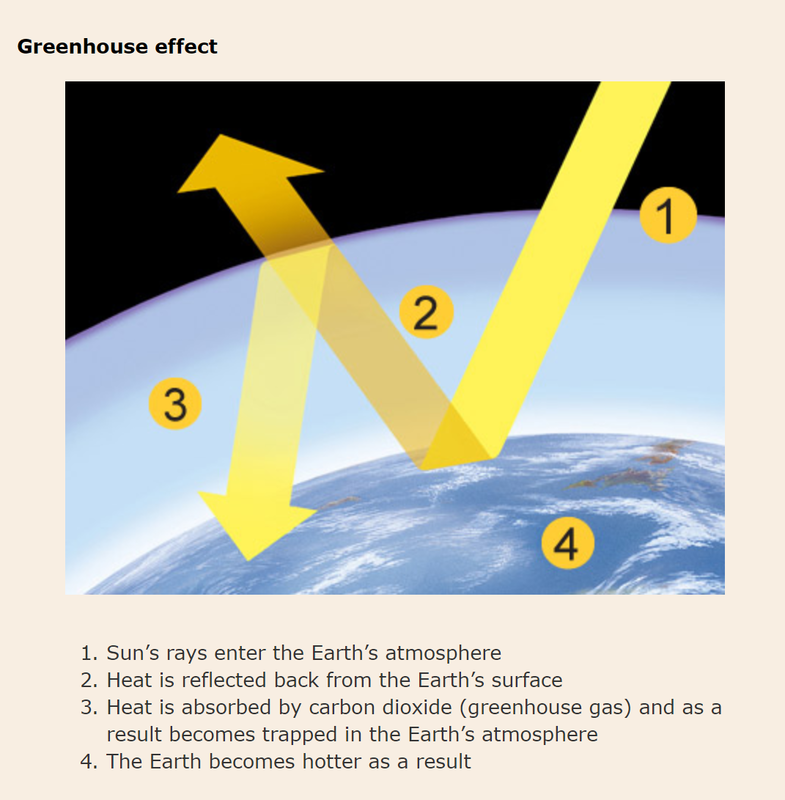 This is often referred to as the "greenhouse effect" (see Figure 3). The physics of the process, supported by the measurements of CO2 concentration in the atmosphere which correlate to average global temperatures, form the basis for what climate scientists have termed "global warming" or "climate change". It is estimated that a rise of just a few degrees in world temperatures will have significant impacts on the climate. One impact is that global weather patterns will change, increasing the risk of drought and flooding in some places or just disrupting what are normal weather patterns. Agriculture will be particularly impacted. The polar ice caps will melt, which will raise sea levels, increase coastal erosion and cause flooding of low-lying areas. The costs that arise from such events are hidden within public and private health expenditures, emergency relief funds, and the degradation of, and subsequent remediation of, the environment. Currently consumers don't pay for these expenses with their electricity bill or when they fill their automobile's gasoline tank, and the costs become a burden on the general population. One of the big issues with the carbon tax is how the money generated from the tax will be used. This can range from simply putting the money into the country's general fund to investing it in the development of green technology to rebating it to consumers and any combination thereof. And there are valid arguments for each of these approaches. To date politicians and lawmakers have not done a good enough job of educating the public to the issues and clearly demonstrating benefits. Consequently, grassroots campaigns have seized on only one side of the argument - the cost to consumers as industrial scale emitters pass the increased cost back onto their customers to the extent possible - and have begun to fight implementation. A good example of this can be seen in the Canadian province of Ontario, which has been operating under a carbon cap-and-trade program since 2017. One of Doug Ford's, the recently elected premier, first actions was to revoke the cap-and-trade program and vow to fight the national government over any attempt to impose a national carbon tax on the province. To see the carbon taxes that have been enacted or proposed around the world, visit Where Carbon Is Taxed. Carbon Tax Center "What's a carbon tax?" Union of Concerned Scientists "The Hidden Costs of Fossil Fuels"
How Stuff Works "How Carbon Tax Works"